The Persuaders were also the Kreshendoes with Chuck Rio. 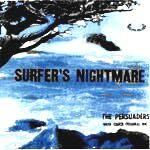 After Chuck Rio left the Champs, he was involved in a studio project band called the Persuaders, which issued this rare and famous album. These tracks range from mostly Latino R&B to in the neighborhood of surf, with reverb and the right feel. Pumpin' piano, party sax, and honkin' riffs tinkle their way into your living room... it's a jam. Big surf a la Bruce Johnston's "Pajama Party" album, with heavy influences from Mickey and Sylvia. Odd, and quite far from center stage. "Hanging Ten" is way more jam-riff than song. It's plinking piano and bluesy progression tell tales of studio filler. The Persuaders lean heavily on David Rose's "The Stripper" and bluesy riffs, with piano and sax honkery. "Surfer's Lullaby" is a slow and shimmering track, lead by vibrato guitar and backed by saucy sax. Not exactly melodic, but really cool. The mood is obvious, the sultry looks cutting, and the danger imminent. Yikes! The title gives it away... "Mama's Little Baby Loves Shortnin' Bread" comes flowing from the childhood gray matter while the boys do a rockin' sax version of the ancient folk tune. Stinging whammy and R&B riffs, shiny aural probes, and raspy sax break lines... a pretty cool track. This was also released as "Kreshendo Stomp" by the Kreshendoes. Jammin' guitar riff rock, nearly watery, and driven, but not even remotely like the Eddie & the Showmen tune that shares the title. Squeelin' sax break, and intense guitar plucking. There's even some damped reverb after the sax snarl. "Caught In The Soup" is a slightly surfy riff rockin' tune, nifty in a rock jam sorta way. Not a standout, but groovy enough. The surf guitar just past the break brings the breakwater into focus. Another jam, surfy guitar tone, and squonkie sax, with cool piano, and a definite groove. "The Raid" is much faster than the others here. It's got more of a manic surf rant style, though it relies on the sax honkin' backtrack like the Crossfires, but without their intense low-E guitar rage. Groovy piano and soulful sax and a riff. This is a slow dramatic sax marauder, with tribal drums and ominous dockside tone. Quite a nice track.